Post updated13/02/15: Congratulations to Kate Malbon, Lisa Wheeler and Seonid Beecham for winning the three copies of ‘The Book of Things’! Last week I published our review of Sarah Dyer’s ‘The Book of Things’. I emailed Sarah an interview ahead of that, but my review ended up so long, I thought I’d publish her answers separately. Here is some background info on the inspiration behind and reason for being, of ‘The Book of Things‘ from its creator, who lives and works in Hove, Sussex with her husband Ben and two young sons Stanley and Ned. LL: Where did the idea for ‘The Book of Things‘ come from? SD: I loved Richard Scarry as a child, we had many of his books and my mum kept them safe in the loft because they were favourites of mine and hers too. We have my childhood copies at home now, and my son Stanley really enjoys poring over them. There’s so much to see and sweet little mini stories happening through them too. Stan particularly likes the transport-based pages. We have other picture and word books, so I know ‘The Book of Things‘ isn’t a new concept – I just really wanted to put my spin on it in terms of content, size of book, and so on. And I really wanted to do something that would hopefully lead to a series of books, which was new for me – it turns out it has [ed’s note: ‘The Book of Colours’ comes out in May – we’ll be reviewing it on LL of course! Look out for another giveaway…]. LL: How has having kids influenced the ‘things’ you decided to draw, the way you grouped them and how you structured the pages? For example, why did you create a ‘small’ and ‘big’ things spread the way you did? (I ask this because this was the spread my two loved the most). SD: The content of the book was so important. Templar gave me eight double pages to work with, so I had to really think about what I felt was important to include. It’s hard not to be too over influenced by Stanley, so a lot of it is my personal choices and what I felt was missing from other word and picture books. I didn’t want the objects and things to all be the same size, so it was quite a deliberate design choice to put ‘small things’ next to ‘big things’, so the scale would be appreciated more. I wanted the big things to almost look like they couldn’t fit into the book, whereas the small things were more ordered like a collection of bits you might sort out from your pocket! I wanted ‘transport’, ‘noisy’, and ‘living’ things to have an extra layer of language – sounds so you could do more with little ones, not just the words, because I remember Stanley learnt sounds first before saying words. 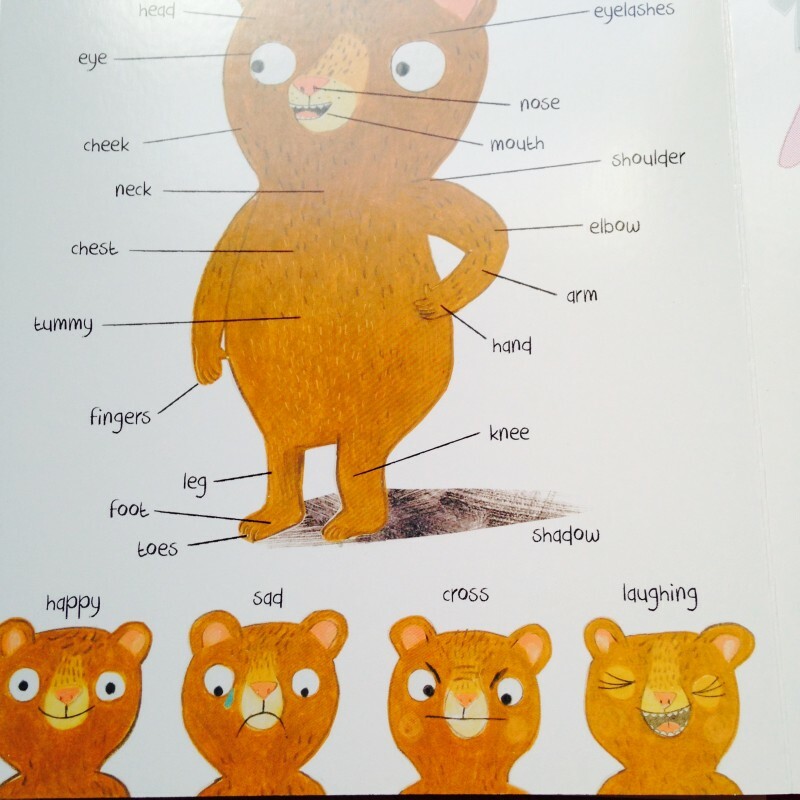 LL: We all loved the more quirky, standout ‘things’ such as the ‘struggle’, and where the bear was turning the page. What lead you to these? They add such a nice little slice of humour to what would otherwise be a ‘point and name’ book – it’s one of the things that my eldest, who as you know is six, liked the most about it. SD: I wanted the book to last longer with a child, and to be enjoyed by more than one sibling. I didn’t want it to be seen as just a baby book, hence there are extra stories to spot: a car crash, a mouse leaving crumbs, and a bear trying to turn the page etc. I really enjoyed putting these sneaky elements in. They’re like a game, and I hope children (and adults) enjoy finding them as much! LL: Thank you dear Sarah, it’s nice to get to know a bit more about the book from its maker! The competition/giveaway closes tomorrow, Friday the 13th of February at midday. So last chance to get sharing! ‘The Book of Things’ is available at Bags of Books in Lewes, which can order copies in for you if they don’t have it in stock. They usually receive ordered-in books within one or two days. If you don’t live in Lewes, it’s also available at hive.co.uk and can be delivered to your local independent for free – or to your home for a standard charge. Disclosure: I bought ‘The Book of Things’ at Bags of Books after I saw a copy of the French version in Sarah’s studio. I approached Templar about reviewing it (which I did here), and they offered to give away three copies. There are a couple of affiliate links placed in this post to The Hive, but otherwise no compensation, financial or otherwise, has been offered or exchanged for the writing of this post. I’m Kate, a copywriter, brand consultant and editor who creates messages that are clear and clean. I create these for brands and agencies both big and boutique, in areas including design, homes and interiors, travel, fashion, lifestyle, beauty, food, and kids and families. I believe clear, clean messages bolster brands and businesses. They evoke emotion and ignite inspiration, and when written well, they’re easier to absorb – and respond to. I live in Copenhagen and am half-English, half-Danish. I write as comfortably in American English as in British, and behind the scenes I'm also studying Danish. Need help getting your message out? Contact me. fabulous…. will be getting my grubby mits on this corker if i win one or not. looks a beauty. well done sarah! As a new mum I’m loving this blog! As an avid reader I can’t wait to share books like this with my gorgeous son!